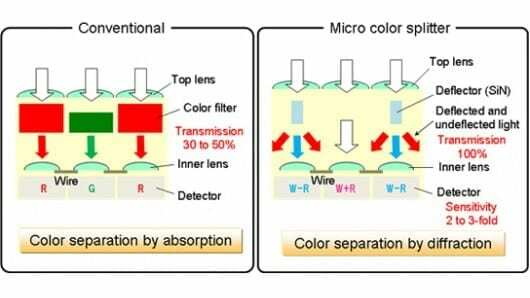 Panasonic has developed a new technology which could replace the color filters used in most digital cameras. Its new Micro Color Splitters work by separating colors at a microscopic scale using diffraction, rather than filtration. This means the technology has the potential to vastly improve low-light photography, and double a camera’s color sensitivity. Since the advent of digital photography, the most common way of producing a color image has been by using a Bayer color filter array on top of an image sensor, which only records light intensity. This means light is filtered into a mosaic pattern of red, blue and green on a pixel level, before being “demosaiced” into a final image with full color information. However, because light is filtered with this method, somewhere between 50-70 percent of it is blocked from ever reaching the sensor. Panasonic says its development addresses the problem and has “almost no loss of light” because it uses a transparent and highly-refractive plate-like structure. This separates colors at a microscopic scale using diffraction. Layout technologies and algorithms are then used to provide precise color reproduction. The key point of the technology is that the Micro Color Splitters are transparent – allowing a much more efficient use of light. Panasonic claims this means photographs can be taken at half the light levels needed by conventional filters and sensors.